Try a fresh new Christmas concept this year by celebrating Christmas in true South African style! 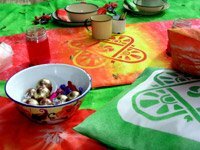 Dalas Sun Colours are simply ideal for our sunny climate so lets celebrate the festive season outdoors, with some good old South African traditions. Bundles of sweets and biscuits are hung on a Laurel or Cypress tree. 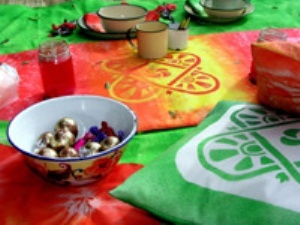 The bundles are formed with colourful bandanas, which are then worn during the meal (A traditional African ritual). We sit on cushions, on a grass mat and eat out of ceramic plates by the gentle light of candle lanterns. The designs are taken from the very popular African shwe-shwe fabric, and then enlarged. This design is repeated on the cushion, the runner, the bandanas and again, using Dalas new Fine Liners, on the serviettes. 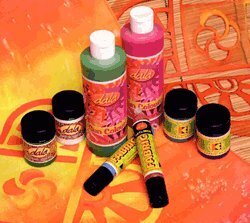 The wrapping paper is made by spraying the design, using Dala Sun Colours, though a stencil onto tissue paper and is bound with Sun Coloured lycra strips. Artliners White, Metallic, Yellow and Peach. Sun ColoursYellow, Scarlet, Lime, Blue. Opaque Fabric paint Yellow, Red, White. 5cm Brush and small brush for Stencil Glue; Pallet; Atomiser bottles; Coarse salt; cling wrap; design and cut-outs/ stencil; white feathers; old blankets / quilt; tissue paper for presents. Picnic blanket: Cream Bull Denim 5cm larger than size of blanket. Wet thoroughly with atomiser bottle. Paint, using large brush, Dala Scarlet Sun Colour. Paint a square of Yellow in the center. The Yellow will partially flow into the Scarlet and create orange. Tip: Place the 2 stencils, nicely centered, onto the sides. The stencils should be treated withDala Stencil Glue on the back, otherwise they might lift and then the fabric does not bleach as it should. When the cloth is dry, remove the stencil and salt. Place the stencil in the centre, on the yellow area and stencil the design with Dala Opaque Yellow, Orange and Red. Iron, or bake in a pre-heated oven, on a piece of tinfoil at 150C for 3 min. Paint the lining area with Scarlet. Tip: Flat quilting can be used for the runner this might work better if the wind blows. Also see Sun Colour > Techniques. Place the fabric outside and wet thoroughly with water. Lime Sun Colour is sprayed onto the wet cloth. Allow to dry on the lawn, if you can, this creates its own special effect. Apply heat setting as above. Fold fabric 5cm around the bottom of blanket and sew in place. Wet lycra or stretchy T-shirt fabric thoroughly and then spray thoroughly with Sun Colour. The fabric does not fray and can be pulled from under the blanket to the top, where a knot or a bow can be made. Plastic can be attached to the underside of the blanket with Velcro, for protection. Follow steps for Sun Technique. 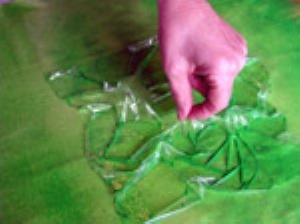 Scrunch up cling wrap on the wet paint and then place in the sun to dry. 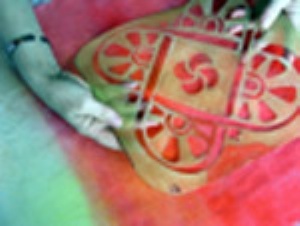 Paint stencil onto scarf with White Opaque. Dry and bake or iron. Follow the Sun Technique by replacing the stencil on a diagonal line. (Tip: wear plastic gloves.) Tie string or elastic bands around the wet, painted cloth and dry in the sun. Metallic, Peach, Yellow and White is used to repeat the small patterns on the serviettes. Tip: A light-box will be a great help here. This item has 828 views.